A pear is the common name for any of about 30 species of small trees or shrubs comprising the plant genus Pyrus, as well as the name for the fruit of these plants. In particular, the term refers to the widely cultivated fruit tree Pyrus communis and its edible fruit. Pyrus is a genus in the rose family (Rosaceae), which also includes apples (genus Malus), plums (genus Prunus), roses (genus Rosa), and strawberries (genus Fragaria), among others. The Pyrus genus is native to Europe, the Middle East, North Africa, and Asia. There are now over 5,000 varieties of pears cultivated in temperate climates worldwide (Herbst 2001). The most popular species for commercial production are the European pear (Pyrus communis) and the Asian pear (Pryus pyrifolia). The fruit of the Asian pear, with a more rounded appearance and harder flesh, appears more similar to the apple than does the fruit of the European pear, which is typically juicy when ripe and more pyriform in shape (bell-shaped). While the fruit of the pear tree provides for the reproduction of the plant—an individual purpose—it also provides a value to the ecosystem and to humans. For the ecosystem, the fruit provides food for the larvae of the Lepidoptera species and other animals. For humans, pears offer a commercial value and provide [[nutrition|nutritious] food, which may be eaten directly or prepared as canned fruit, juice, and dried fruit, as well as in jellies and jams. The tree itself, with the beautiful white flowers and sometimes shiny or even silvery leaves, is often used as a decorative plant, and the wood is used for manufacturing woodwind instruments and furniture. Pears typically are medium-sized trees, reaching 10 to 17 meters in height, often with a tall, narrow crown. A few species are shrubs, being smaller in height. The leaves are alternately arranged, simple, 2–12 centimeters long, glossy green on some species, densely silvery-hairy in some others. The leaf shape varies from broad oval to narrow lanceolate. Most pears are deciduous, but one or two species in Southeast Asia are evergreen. Most are cold-hardy, withstanding temperatures between −25 °C and −40 °C in winter, except for the evergreen species, which only tolerate temperatures down to about −15 °C. Cold in the winter is needed to break dormancy. Most pears require about 900 to 1,000 chill hours to break dormancy, but some cultivars exist that have lower chill requirements, and many Asian cultivars have lower chill requirements and can be grown as far south as northern Florida (Riegel 2006). The flowers are white, rarely tinted yellow or pink, 2 to 4 centimeters in diameter, and have five petals. The inflorescence is corymbose, with 5 to 7 flowers (Riegel 2006). Like that of the related apple, the pear fruit is a pome, which in most wild species is only 1 to 4 centimeters in diameter, but in some cultivated forms up to 18 centimeters long and 8 centimeters broad. The shape varies from globose in most species, to the classic "pear-shape" (bell shape) of the European pear (Pyrus communis), with an elongated basal portion and a bulbous end. The pear is very similar to the apple in floral structure, cultivation, propagation, and pollination. In both cases, the so-called fruit is composed of the receptacle or upper end of the flower-stalk (the calyx tube) greatly dilated, and enclosing within its cellular flesh the five cartilaginous carpels that constitute the "core" and are really the true fruit. From the upper rim of the receptacle are given off the five sepals, the five petals, and the very numerous stamens. Another major relative of the pear (and thus the apple) is the quince. The form of the pear and of the apple respectively, although usually characteristic enough, is not by itself sufficient to distinguish them, for there are pears that cannot by form alone be distinguished from apples and apples that cannot by superficial appearance be recognized from pears. The main distinction is the occurrence in the tissue of the fruit, or beneath the rind, of clusters of cells filled with hard woody deposits in the case of the pear, constituting the "grit" (or "stone cells"), while in the apple no such formation of woody cells takes place. The appearance of the tree—the bark, the foliage, the flowers—is, however, usually quite characteristic in the two species. The fruit of pears range from celadon green to golden yellow to tawny red (Herbst 2001). The most popular tree for commercial production, at least in the West, is Pyrus communis, the European pear. Among this species, the most popular varieties are Bartlett, d'Anjou, Bosc, Comice, Seckel, and Winter Nelis. The Bartlett represents about 75 percent of pear production in the United States and is the most common pear cultivar in the world (Riegel 2006). The European pears are sweeter and softer than apples. Although European pears are easily bruised when ripe, they are generally picked when still hard, which, unlike most fruit, actually improves the texture and flavor (Herbst 2001). The second most popular commercial species, popular in Asia, is Pyrus pyrifolia, the Asian pear (also known as Japanese pear and Oriental pear). The Asian pairs are more like apples, with hard, crisp, less juicy flesh, and they are allowed to ripen fully on the trees (Riegel 2006). Although there are thousands of different varieties of pears, almost all commerce is based on only about 20 to 25 cultivars of European pears and 10 to 20 cultivars of Asian cultivars (Riegel 2006). Today, pears are commercially produced in 81 countries on 4.3 million acres, yielding about 18,000 metric tons (39.4 billion pounds) in 2004 (Riegel 2006). China leads world production, with about 56 percent of the production (although figures from China are not considered reliable), followed by Italy (5 percent) and the United States (5 percent) (Riegel 2006). The leading states for production in the United States are Washington, California, and Oregon. Total U.S. production in 2004, according to the United States Department of Agriculture, was 812,000 metric tons (1.8 billion pounds) (Riegel 2006). Cultivated pears, whose number is enormous, are without doubt derived from one or two wild species widely distributed throughout Europe and western Asia, and sometimes forming part of the natural vegetation of the forests. In England, where the pear is sometimes considered wild, there is always the doubt that it may not really be so, but the produce of some seed of a cultivated tree deposited by birds or otherwise, which has degenerated into the wild spine-bearing tree known as Pyrus communis. The cultivation of the pear extends to the remotest antiquity. Traces of it have been found in the Swiss lake-dwellings, it is mentioned in the oldest Greek writings, and was cultivated by the Romans. The word pear or its equivalent occurs in all the Celtic languages, while in Slavonic and other dialects different appellations, but still referring to the same thing, are found–a diversity and multiplicity of nomenclature which led Alphonse de Candolle to infer a very ancient cultivation of the tree from the shores of the Caspian to those of the Atlantic. A certain race of pears, with white down on the under surface of their leaves, is supposed to have originated from P. nivalis, and their fruit is chiefly used in France in the manufacture of Perry (pear cider, an alcoholic beverage). Other small-fruited pears, distinguished by their precocity and apple-like fruit, may be referred to P. cordate, a species found wild in western France and in England. Pears may be raised by sowing the seeds (pips) of common cultivated or wild varieties, forming what are known as free or pear stocks, on which choicer varieties are grafted for increase. For new varieties, the flowers should be pollinated with a view to produce the desirable qualities of the parents in the seedlings that result from the union. Dwarf and pyramid trees, more usually planted in gardens, are obtained by grafting on the quince stock, the Portugal quince being the best. However, this stock, from its surface-rooting habit, is most suitable for soils of a cold, damp nature. The pear-stock, having an inclination to send its roots down deeper into the soil, is the best for light, dry soils, as the plants are not then so likely to suffer in dry seasons. Some of the finer pears do not unite readily with the quince, and in this case double working is resorted to; that is to say, a vigorous-growing pear is first grafted on the quince, and then the choicer pear is grafted on the pear introduced as its foster parent. In selecting young pear trees for walls or espaliers, some individuals prefer plants one year old from the graft; however, trees two or three years trained are equally good. The trees should be planted immediately before or after the fall of the leaves. The wall trees should be planted 25 to 30 feet (8 to 10 meters) apart when on free stocks, and from 15 to 20 feet (5 to 7 meters) when dwarfed. Where the trees are trained as pyramids or columns, they may stand 8 or 10 feet apart, but standards in orchards should be allowed at least 30 feet, and dwarf bush trees half that distance. In the formation of the trees, a similar plan may be utilized as with apples. For a pear orchard, a warm situation is very desirable, with a soil that is deep, substantial, and thoroughly drained. Any good free loam is suitable, but a calcareous loam is the best. Pear trees worked on the quince should have the stock covered up to its junction with the graft. This is effected by raising up a small mound of rich compost around it, a contrivance that induces the graft to emit roots into the surface soil. 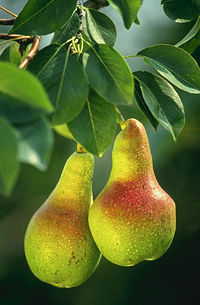 The fruit of pears is produced on spurs, which appear on shoots more than one year old. The mode most commonly adopted of training wall pear-trees is the horizontal. For the slender twiggy types, a fan form is preferred, while for strong growers the half-fan or the horizontal is more suitable. In the latter form, old trees, where summer pruning has been neglected, are apt to acquire an undue projection from the wall and become scraggy; to avoid this, a portion of the old spurs should be cut out annually. Summer pruning of established wall or espalier-rail trees consists chiefly in the timely displacing, shortening back, or rubbing off of the superfluous shoots, so that the winter pruning, in horizontal training, is little more than adjusting the leading shoots and thinning out the spurs—which should be kept close to the wall and allowed to retain but two or at most three buds. In fan-training, the subordinate branches must be regulated, the spurs thinned out, and the young laterals finally established in their places. When horizontal trees have fallen into disorder, the branches may be cut back to within 9 inches of the vertical stem and branch, and trained anew, or they may be grafted with other sorts, if a variety of kinds is desired. Summer and autumn pears should be gathered before they are fully ripe; otherwise they generally will not keep more than a few days. The Jargonelle should be allowed to remain on the tree and be pulled daily as wanted. In the case of the Crassane, the crop should be gathered at three different times, the first a fortnight or more before it is ripe, the second a week or ten days after that, and the third when fully ripe. One of the most serious diseases is the fire blight or pear blight, a bacterial disease (Erwinia amylovora). Pears also are afflicted with other bacteria and fungi, as well as other disorders or parasites. Ecologically, pear trees are used as food plants by the larvae of a number of Lepidoptera species. The plants also serve as a habitat for animals. Commercially, pears are consumed fresh, canned, as juice, and occasionally dried. The juice can also be used in jellies and jams, usually in combination with other fruits or berries. Fermented pear juice is called perry. In the United States, about 55 to 60 percent of commercial pears are marketed as fresh fruit, with most processed fruit canned (Riegel 2006). Pears are high in fiber, as well as substantial amounts of potassium, vitamin C, and phytochemicals (the latter of which helps to prevent disease). Riegel (2006) reports that a 100-gram portion of pear fulfills about 9 percent of the recommended daily allowance of vitamin C set by the U.S. Food and Drug Administration, based on a 154-pound male consuming 2,700 calories per day. It provides lesser amounts of riboflavin, thiamin, niacin, and vitamin A.
Pears are the least allergenic of all fruits. Along with lamb and soya formula, pears form part of the strictest exclusion diet for allergy sufferers. While only two species dominate the market for edible fruit purposes—the European pear Pyrus communis and the Asian pear Pyrus pyrifolia—thousands of cultivars have been developed of these two species. Other species are used as rootstock for European and Asian pears and as ornamental trees. The Siberian pear, Pyrus ussuriensis (which produces unpalatable fruit) has been crossed with Pyrus communis to breed hardier pear cultivars. The Bradford pear, Pyrus calleryana, in particular, has become widespread in North America and is used only for decoration. The willow-leafed pear, Pyrus salicifolia, is grown for its attractively slender, densely silvery-hairy leaves. Riger, M. 2006. Pears: Pyrus communis, Pyrus pyrifolia. University of Georgia. Retrieved May 22, 2007. This page was last modified on 2 April 2008, at 14:00.